"Get Your 24/7 Online Store Now!" How To Build a Global Business From Your Phone! Yes, the best way to become a millionaire in 5 years or less is network marketing! I speak from 25 years of network marketing knowledge and experience, and I created the Create Wealth System Forum and Think Out Of The Box Program to help people to achieve that! This viral report offers you an irresistible offer! A great opportunity to build a global business in 90 countries for a very small one-time investment in a business builder package for $1,026 or $336 only! I know many ladies who spent more than this on a branded bag or a pair of shoes! When you divide $1,026 by 365 days it is only $2.81 a day! And when you divide $336 by 365 days, that is only 92 cents a day! When you invest in the business builder package, you get the 4 Days/3 Nights Premium Ground Tour Package at a beautiful Durian Farm Resort in Penang! This package is for serious business builders and if you happen to be a durian lover, you got a bonus! This is my irresistible offer to you! Your very small one-time investment for the business builder package is $1,026 only! You are getting great value because I've invested in many 2-day or 3-day seminars that cost $3,000 to $4,000 to attend and they only provide coffee and tea, lunch is on your own. This premium ground tour package does not include the round-trip air tickets to Penang, you have to purchase your air tickets. Speak to the person who shared this viral report with you, call 8168 2088 now! Or click on the link below to join the global business. To benefit greatly from the special "Think Out Of The Box" program, just order the products I've recommended or any products that add up to $336 or more, the most important step is to start! Hi, this is Bruce Seah, Asia No.1 Home-Based Business Coach, with 25 years of network marketing and 19 years of internet marketing experience. I want to share my knowledge and experience to help as many people as possible to live a better life! For the 2-Day Create Wealth System Forum, I'll be the chief co-ordinator and trainer, my co-trainer is Jacky Cheng, a multi-millionaire entrepreneur in the education business. You will be given a replicated website link. When you are part of our team, you can leverage on my viral reports and replace the website link and contact numbers with yours, print it and share it with a friend over a cup of coffee. You can share the business online by sending emails to friends with your website link or share it on social media such as facebook, twitter, youtube, etc. Call 8168 2088 now or click on the website link below to join us now! I am working with 4Life Research, a rock-solid 20-year old company with offices in 25 countries and offers you a powerful e-commerce platform to build a global business in 90 countries! 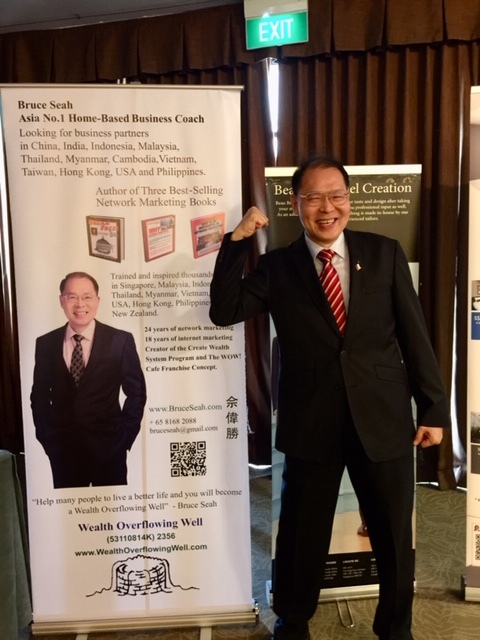 The Create Wealth System Forum and Think Out Of The Box Program is only available in Singapore and I am looking for business partners to make it available in many countries! To find out more about this great opportunity, call 8168 2088 now! Or click on the website link below and join us now! Let me share a bit of my success story, it is not to impress you but to impress upon you that I know exactly what I'm sharing with you. I made my first million in network marketing, and I did it by thinking out of the box, I didn't use a cent of my own, I used my credit card, the bank's money or other people's money. I've trained and inspired thousands in Singapore, Malaysia, Indonesia, Thailand, Myanmar, Vietnam, Nigeria, USA, Hong Kong, Philippines and New Zealand. I've written three best-selling books on network marketing, Break Free! - There Is A Better Way To Earn A Living, Why Network Marketing? and How To Be Successful in Network Marketing. My books are sold out. I'm looking for a good publisher to republish them and I'll donate 100% of my royalty fees to help feed hungry children and to build wells to provide clean drinking water where it is desperately needed. To find out more about this great opportunity, call 8168 2088 now! Or click on the website link below and join now! Love, Learn, Leverage and Live Your Dream! P.S. Here is my million-dollar success formula, it helped me to make my first million in network marketing, "If not now, when? If not you, who? It is not how to? It is always why do??" Network Marketers Who Are Struggling Must Watch This 10-Minute Video And 7-Minute Video! Share The Success “FORMULA!” To Unlimited Wealth! How To Have Thousands of Affiliates Selling Your Network Marketing Opportunity For You! How To Earn 56.95 or $159.95 A Day In A Free Affiliate Program!